Tlaloc is a major Aztec deity who was associated with a wide variety of things. He was considered the god of water, and was consequently associated with springs and water bodies in the mountains. He was also considered the god of fertility and a life-giver. Tlaloc has a central position in the Aztec world-view where he is linked with both space and time. In the Aztec creation mythology, the world witnessed several cycles of the Sun which culminated in disaster. Tlaloc overlooked the third of these cycles and his cycle ended with the world in flames. 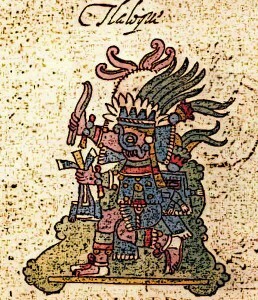 An exact history of the Aztec deity called Tlaloc is hard to formulate. This is because Tlaloc figured in many other cultures and civilizations before the Aztecs. In fact, a storm god who was associated with water and fertility was present in the ancient city of Teotihuacan as well as in the Mayan pantheon. It has also been surmised that a deity similar to the Tlaloc existed as far back as the Olmec civilizations which was the precursor to most subsequent civilizations in the Mesoamerican region. What can be said for certain regarding Tlaloc’s history is that one of the shrines on top of the Templo Mayor at Tenochtitlan was dedicated to him. This shows that he enjoyed a central position in the Aztec pantheon. In the city of Teotihuacan, Tlaloc was associated with water as well as thunder. Since people at Teotihuacan thought that the thunder was caused by the jaguar, they used jaguar teeth and other features to depict the god Tlaloc. This same tradition was followed in the Aztec city of Tenochtitlan as well where jaguar skulls and entire skeletons were offered to Tlaloc as a tribute. Other symbols used to depict Tlaloc included cornstalks, lightning bolt wands and a jar of ritual water. All of these reflected different aspects of Tlaloc. These depictions were markedly different from the representations of Tlaloc in the Mayan pantheon where he was not associated with thunder. The Aztecs believed that Tlaloc was charged with overlooking the fourth layer of the heavens. This layer was called Tlalocan and Aztecs believed that anyone who’s death was caused by any form of water, including drowning or any of the diseases which produced fluids in human body, was entitled to enter Tlalocan. Tlalocan itself was considered a heavenly place where there was greenery and where spring never came to an end. The place was somewhat of a paradise in the Aztec mythology. Aztecs clearly identified such deaths which were linked to Tlaloc. As mentioned above, these included all such deaths which were caused by water in any form. Usually Aztecs cremated their dead, but those who were expected to go to Tlalocan after death were not cremated. They were rather buried with seeds and a dagger in their hand, so that they could plant the seeds. Aztecs also placed water-related objects such as seashells and sand at Tlaloc’s temple atop of Templo Mayor. At a Tlaloc-related festival celebrated by the Aztec during February and March, seven children were sacrificed to the deity each year. This was thought to bring rain and abundance to the harvest. At a distance of 44 miles from Templo Mayor was situated a mountain called “Mount Tlaloc” by the Aztecs. This was considered the sanctuary of the god Tlaloc and people traveled to this place from long distances. A shrine was located at the top of this mountain and it was called Tlalocan. Inside the shrine were four pitchers of water. Legend had it that the water from each pitcher brought a different fortune to the crops if used on them. The water of one of these pitches, for instance, was said to cause a good harvest, water from the second pitcher was said to dry the harvest, the third pitcher’s water caused rot in the crops and that from the fourth pitcher caused the crops to freeze. In Aztec society, Tlaloc was associated with water and any living and non-living bodies containing water. So, for instance, springs were used in symbolizing Tlaloc and it was believed that water-related objects such as sand could be used to ask Tlaloc for favors. Animals such as herons and different water-dwelling creatures such as snails and seashells were associated with him. 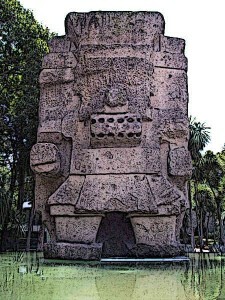 Tlaloc himself was believed to live inside a mountain cave and his shrine at the Templo Mayor symbolized this mountain. A number of festivals were celebrated by the Aztecs in the name of Tlaloc. Among these were many festivals where child sacrifices were offered to please the deity. The festival of Atlcahualo, for instance, was celebrated in February and March. The festival of Tozoztontli was celebrated in March and April. Both of these involved child sacrifices and offerings to Tlaloc were made in dark caves. Another Tlaloc-related festival was named “Atemoztli” and it took place after the rainy season in December. This festival was more of a tribute in which Aztecs made dough statues and presented food and incense to them as thankfulness for the rain. After they were presented with food, the statues were ripped open and their “hearts” taken out in imitation of the actual human sacrifice. Tlaloc was one of the central deities of the Aztec pantheon. He was associated with rain, water and fertility. Aztecs looked to him in order to get rains for their crops. They celebrated many festivals and performed different rituals in order to appease the god. Aztecs believed that through these festivals and rituals, they persuaded the god to send them rains each year. Tlaloc was also considered the god who overlooked the Aztec paradise, called Tlalocan. It was believed that everyone who died of a water-related death went to this paradise situated in the fourth layer of the heavens. This is why the Aztecs didn’t cremate those who died of a water-related cause and simply buried them with a handful of seeds.